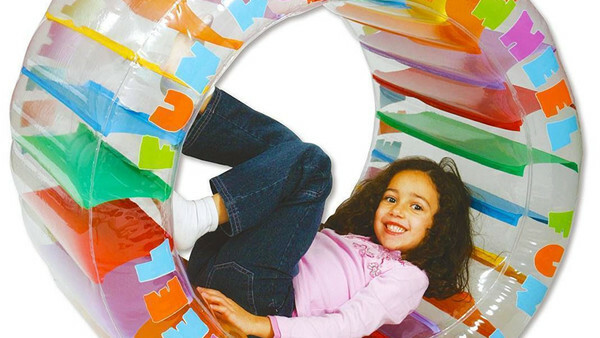 Given the eternal appeal of zorbing and generally rolling around that's instilled in all of us from an early age, it's always great to see products released that cater purely towards that sort of combined fun. Step forward the Thumbs Up Roller Wheel - an inflatable child-sized wheel for children to get inside and basically tumble about in to their hearts content, both on dry land and in a pool (to mix things up a little). The lightweight product is durable (enough to take an adult "testing" this, I can assure you), easy to put together (all you need is a strong set of lungs and honestly, it doesn't take all that long to inflate) and appeals to that universal joy of pretending to be a hamster while hurtling towards delicious dizziness, all while protected inside a comfortable rubber ring. Playing outside with it inevitably runs the risk of punctures, but there is a patch kit included and one deflation should pretty quickly help you realise it's better to play indoors if you don't have a good patch of grass to play on. Especially with winter now here. Just make sure you clear away the valuables. You could make a claim that this sort of play will help coordination and balance and that the colours are good for cognitive development in younger players, but honestly, it's just a really fun toy that your kids will absolutely love. And the more toys we can encourage them to play with that don't rely heavily on screen time and lots of technology, the better. The Thumbs Up Roller Wheel RRPS at £39.99 from Amazon.